The Czech Republic’s Zdena Blaskova and Nadezhda Bogdanova emerged as the players to cause the most notable upsets as play commenced in the Women’s event at the Buenos Aires 2018 Youth Olympic Games European Qualification Tournament in Split, Croatia on Friday 3rd November, the opening day of action. Contrary to expectations, both beat seeded opposition, both ended the day unbeaten and thus secured first places in their respective groups. Zdena Blaskova overcame the host nation’s Andrea Pavlovic, the no.6 seed (12-10, 13-15, 11-8, 11-9, 12-10); Nadezhda Bogdanova accounted Sweden’s Christina Källberg (13-11, 11-8, 7-11, 8-11, 11-5, 11-9). Defeats but for Nadezhda Bogdanova and Christina Källberg, it was their only defeats, thus they progressed to “Draw A”. Organised on a progressive knock-out basis, the players who reach the final gain invitations to the Buenos Aires 2018 Youth Olympic Games. Upsets as play commenced; for other notable names there was success but there were testing times. Slovakia’s Tatiana Kukulkova and Lucie Gauthier of France both experienced six games duels. Tatiana Kukulkova, the no.5 seed, eventually overcame Poland’s Anna Wegrzyn (8-11, 11-5, 11-4, 11-3, 7-11, 11-9); whilst Lucie Gauthier, the no.7 seed, had to dig deep against Italy’s Jamila Laurenti (2-11, 11-9, 11-5, 11-4, 7-11, 11-9). 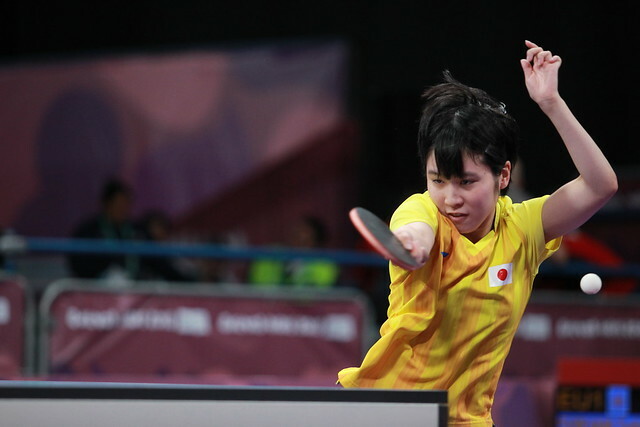 First place in the group secured, for the top four names on duty in the Women’s Singles event there were no such difficulties; Azerbaijan’s Ning Jing, Russia’s Mariia Tailakova and Romania’s Andreea Dragoman alongside Serbia’s Sabina Surjan duly topped their groups in style. Meanwhile, as matters commenced in the Men’s event, there was an upset of note and a close call. Impressively, Belgium’s Laurens Devos beat Germany’s Kay Stumper, the no.8 seed (11-7, 13-11, 11-8, 11-4); Italy’s Matteo Matteo Mutti was the player tested. He needed six games to overcome Lithuania’s Medardas Stankevicius (12-14, 11-5, 11-8, 11-4, 7-11, 11-3).